One of the main goal of the LIFE MONZA Project, which started in September 2016, is to reduce the average noise levels present in the Libertà district by means of both top-down (creation of a limited traffic zone to forbid the access to trucks, limitation of vehicles speed, lanes-width reduction and pedestrian crossing introduction, substitution of the current asphalt with a silent one) and encouraged bottom up actions (pedibus service, etc). 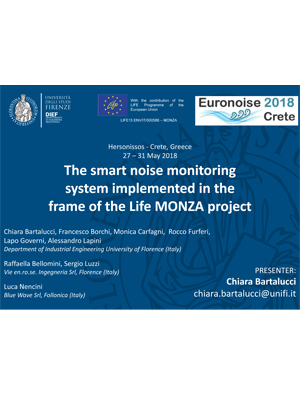 To monitor the noise levels trends before and after the interventions implementation, both smart and traditional noise monitoring systems have been de-signed and installed. The smart monitoring system consists in 10 low cost noise monitoring units in-stalled in strategic position in the Libertà district, acquiring the noise time history, every second, of the sound pressure in terms of broadband and 1/3 octave band levels. The transmission system on board of each control unit is designed to guarantee a minimum transmission time per hour to a central server unit from which data can be visualized in almost real time, elaborated and downloaded. The smart monitoring system was first tested for two months in correspondence of the Polo Scientifico of Sesto Fiorentino and then installed in the Libertà district of Monza where it started to collect data from June 2017. Furthermore, an on site verification procedure was developed and three verifications have been performed until now. In this paper the structure and the positioning of the smart noise monitoring system is presented, together with indications about how data can be visualized in the server. Moreover, first results obtained after the first monitoring period are illustrated.